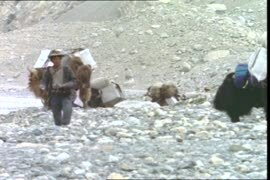 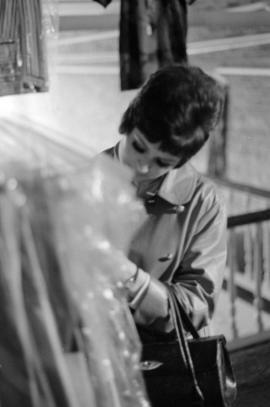 Item is photograph showing close-up of Susan Kochen or Sheryl Hunter looking through clothes. 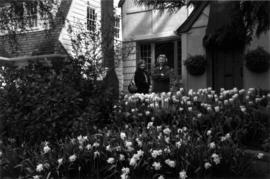 Item is photograph showing two women holding vases. 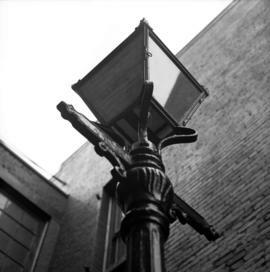 Item is photograph showing close-up of a lamp post in Gastown. 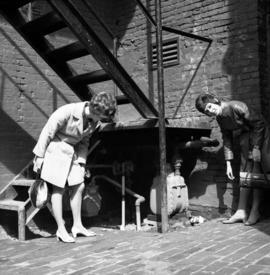 Item is photograph showing Susan Kochen and Sheryl Hunter inspecting water gauges located underneath a fire escape in Gastown. 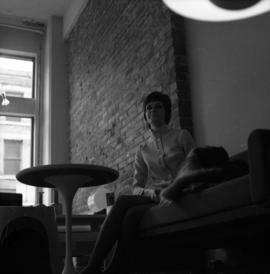 Item is photograph showing Susan Kochen or Sheryl Hunter sitting on a couch inside a living room. 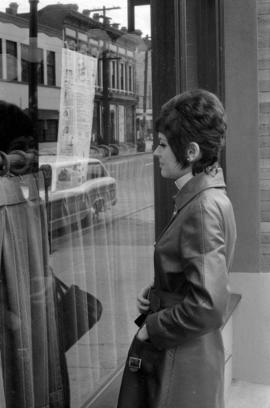 Item is photograph showing Susan Kochen or Sheryl Hunter standing outside, looking through a display window.  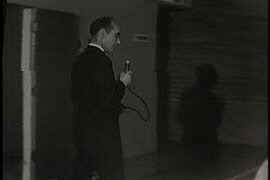 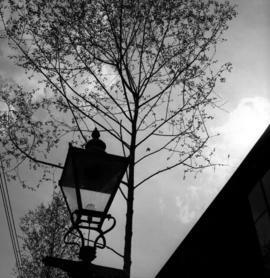 Item is photograph showing close-up of a lamp post. 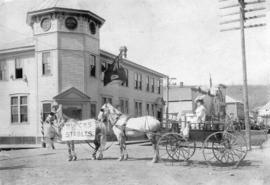 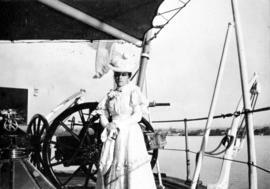 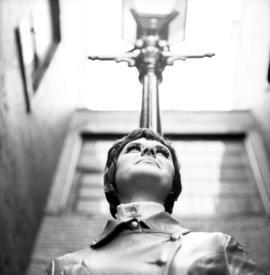 Item is photograph showing Susan Kochen or Sheryl Hunter standing next to the "Gassy" Jack Deighton statue in Gastown. 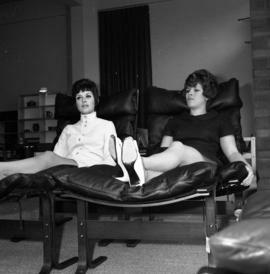 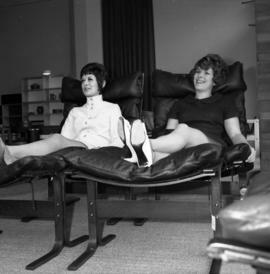 Item is photograph showing Susan Kochen and Sheryl Hunter testing out chairs in a display living room. 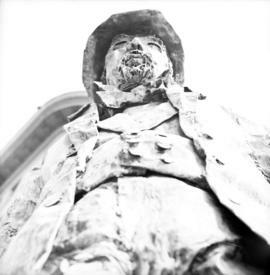 Item is photograph showing close-up of the face of "Gassy" Jack Deighton statue in Gastown. 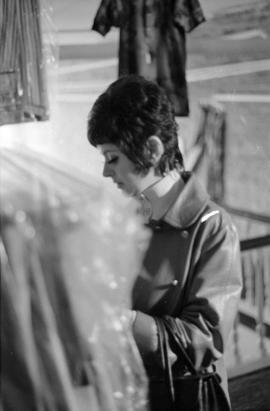 Item is photograph showing Susan Kochen or Sheryl Hunter sitting on a couch looking at a blanket. 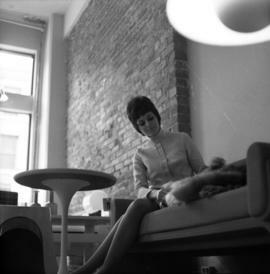 Item is photograph showing Susan Kochen or Sheryl Hunter sitting on a couch and looking at a blanket. 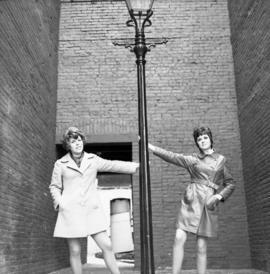 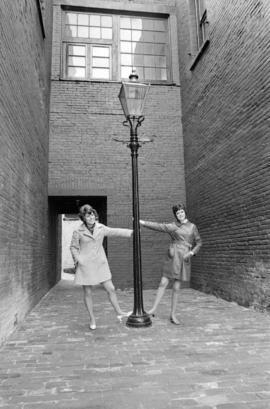 Item is photograph showing Susan Kochen and Sheryl Hunter swinging around a lamp post in Gastown. 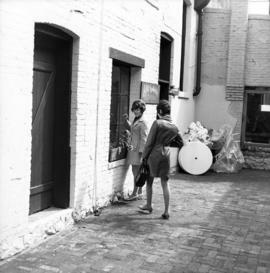 Item is photograph showing Susan Kochen and Sheryl Hunter looking through a brick building window. 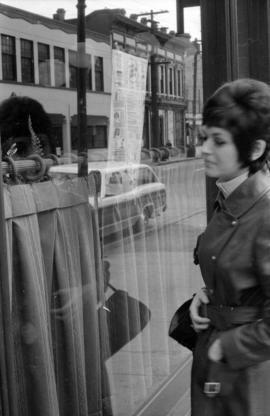 Item is photograph showing profile of Susan Kochen or Sheryl Hunter standing behind a door in a lingerie store. 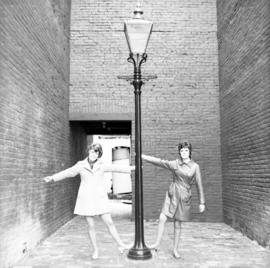 Item is photograph showing Susan Kochen or Sheryl Hunter standing beneath a lamp post. 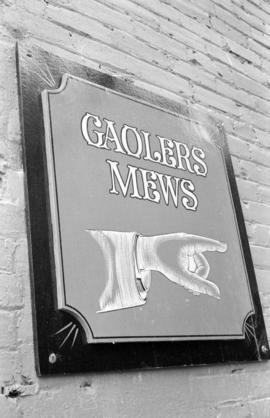 Item is photograph showing a close-up of direction sign for Gaolers Mews. 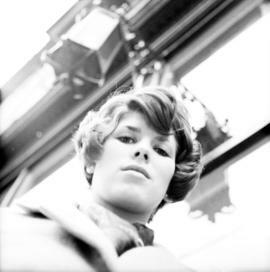 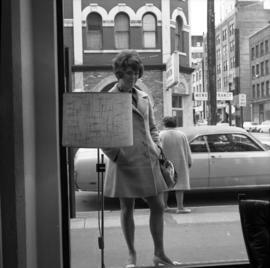 Item is photograph showing Susan Kochen or Sheryl Hunter looking into a restaurant window. 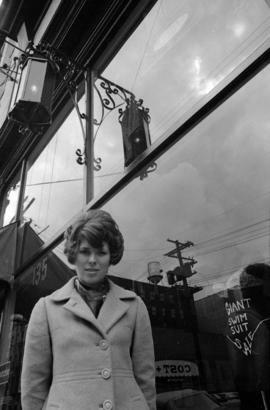 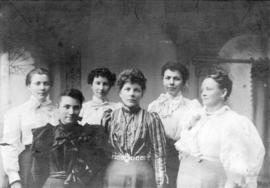 Item is photograph showing Susan Kochen or Sheryl Hunter standing in front of a shop window in Gastown. 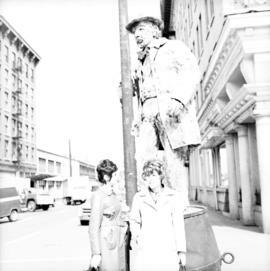 Item is photograph showing Susan Kochen and Sheryl Hunter standing next to "Gassy" Jack Deighton statue in Gastown. 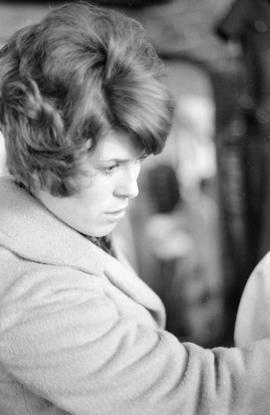 Item is photograph showing Susan Kochen and Sheryl Hunter looking through a shop window. 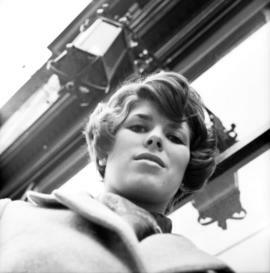 Item is photograph showing close-up of Susan Kochen or Sheryl Hunter. 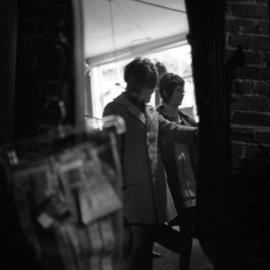 Item is photograph showing Susan Kochen and Sheryl Hunter looking through clothing inside a store. 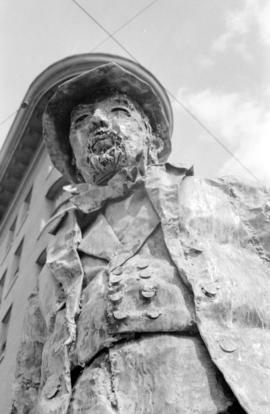 Item is photograph showing statue of Gassy Jack Deighton. 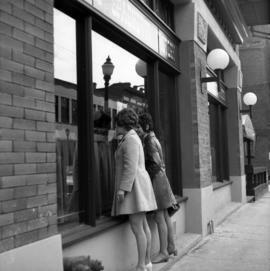 Item is a photograph showing Susan Kochen or Sheryl Hunter looking at the menu taped to a window of the Old Spaghetti Factory restaurant at 53 Water Street in Vancouver. 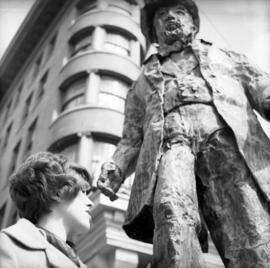 Item is photograph showing Susan Kochen or Sheryl Hunter looking through the legs of "Gassy" Jack Deighton statue in Gastown. 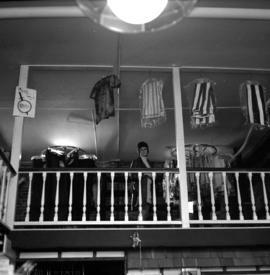 Item is photograph showing Susan Kochen or Sheryl Hunter looking down from the second floor of a clothing store. 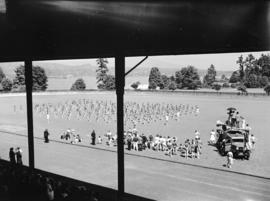 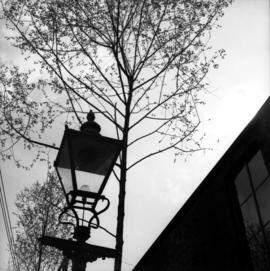 Item is photograph showing close-up of a lamp post and a tree.